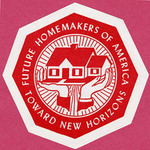 The Future Homemakers of America is precursor to the Family, Career and Community Leaders of America and is a nonprofit national career and technical student organization that provides personal growth, leadership development, and career preparation opportunities for young men and women in Family and Consumer Sciences education in public and private school through grade 1. The Future Homemakers of America – Columbia High School Chapter Records consists of scrapbooks, newsletters publications, club records, and photographs and memorabilia relating to activities of the Columbia High School Chapter from 1944-1969. The Future Homemakers of America-Columbia High School Chapter Records were donated to the Archives by Ruth Dantzler on April 28,1980. Louise Pettus Archives and Special Collections, Winthrop University, "Future Homemakers of America-Columbia High School Chapter Records - Accession 319". Finding Aid 814.